I have been a teacher for 29 years, a Headteacher for 14 years and, at the age of (nearly) 53, this much I know about how our colleagues are first and foremost people. If I have learnt anything in my time as a head teacher, it has been the value of chatting with my colleagues about things other than work. We all have a life going on beyond school, a life which is more important and which is often emotionally demanding. I am amazed, on a regular basis, at how colleagues keep doing a great job when they are living through difficult times outside of school. My first duty as a head teacher was to attend a funeral of a new colleague whose husband had died in his mid-forties during the last week of August. She had gone to bed and left him watching the telly. When she woke up the next morning she went downstairs to find him dead on the sofa. Everyone has a backstory. Our colleagues are first and foremost people, something school leaders like me do well to remember. My big sister, Bev, was six years old when I was born. Imagine! Mother brought home to Bev her very own baby dolly, but it was for real, with real tears, real nappies and a real feeding bottle. I doubt she ever left me alone. No wonder the first word I ever said was, ‘Bev’. 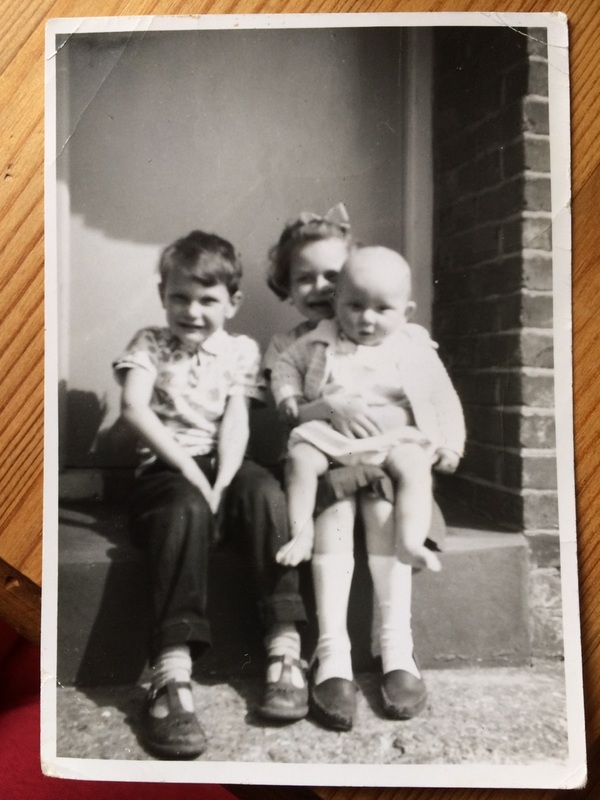 Here she is with my elder brother David, just about managing to keep my top heavy self on her knee. Over the last two months I have journeyed to Weymouth and back every other weekend to see Bev. She has been slowly dying of cancer. A couple of weekends ago she gave me one of her most prized possessions, a mini-trophy for taking six catches at a Stoolball tournament when she was in her teens. On the train home I wrote this unrhymed sonnet; the rhymes are there but not at the ends of the lines, reflecting the sense of dislocation I felt as she went into decline. Early yesterday evening Bev died. She was just 59 years old. In his final interview before he died at the age of 61, Philip Gould, Tony Blair’s close adviser, said this to Andrew Marr and I have had it pinned on my office wall ever since: ‘What would have been better for me would have been to have said, “I’ll do what I can do, which I do quite well” and then just push it back a little bit’. Gould’s insight came too late for him, but it isn’t too late for me or you. Very touching John and a lovely story – my condolences to you and your family. In teaching, “I’ll do what I can do, which I do quite well” and then just push it back a little bit’ is very pertinent. Hopefully school leaders will listen carefully, especially when staff do have difficulties outside of school. This must have been a difficult piece to write. My brother died from cancer just 5 weeks ago. I have been astounded by the kindness and generosity of my colleagues and of the young people I am fortunate to teach. It puts things in perspective – I’ll do what I can do. My sincerest sympathy to you. My condolences too. So sad when people we love, leave life too early. I always love reading your blog. I think you are a fair and kind man. She must have been very proud of you. Continue to make her proud. God bless all those who we miss, who are Taken from us, who we have enjoyed and who have made us a better person. A moving piece of writing and a reminder that, whatever the external pressures, teaching and education are first and foremost about relationships.